Behringer has introduced the CE1000P, a compact set of loudspeakers aimed at permanent installations such as restaurants, shops, exhibitions or houses of worship. Mills Acoustics Introduces the EVM Series Afterburner Cab. 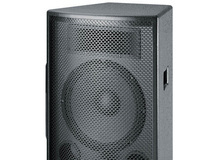 Danley Sound Labs Unveils SH-96 Loudspeaker at Infocomm 2008. Carvin Introduces Lsx Series Loudspeakers, designed to address a wide range of SR applications. Samson introduce their re-imagined Resound line,with beefier woofers and upgraded compression drivers. D.A.S. Audio launches a newly designed Reference series, consisting of six two-way systems and three subwoofer systems. D.A.S. Audio launches the Artec series, a range of compact systems designed to provide wide bandwidth and high SPL in a visually discrete package. [NAMM] Peavey upgrades its SP™ Series. Peavey introduces its redesigned version of the SP Series loudspeaker systems.